Seal show is one of the many staged animal shows at Taronga Zoo, Sydney. I witnessed it during my visit and thoroughly enjoyed it. Besides entertaining the audience, show also makes an effort to educate audience on various specialties of seals and dangers faced by them in the ocean. During the show, each seal is guided by its trainer. 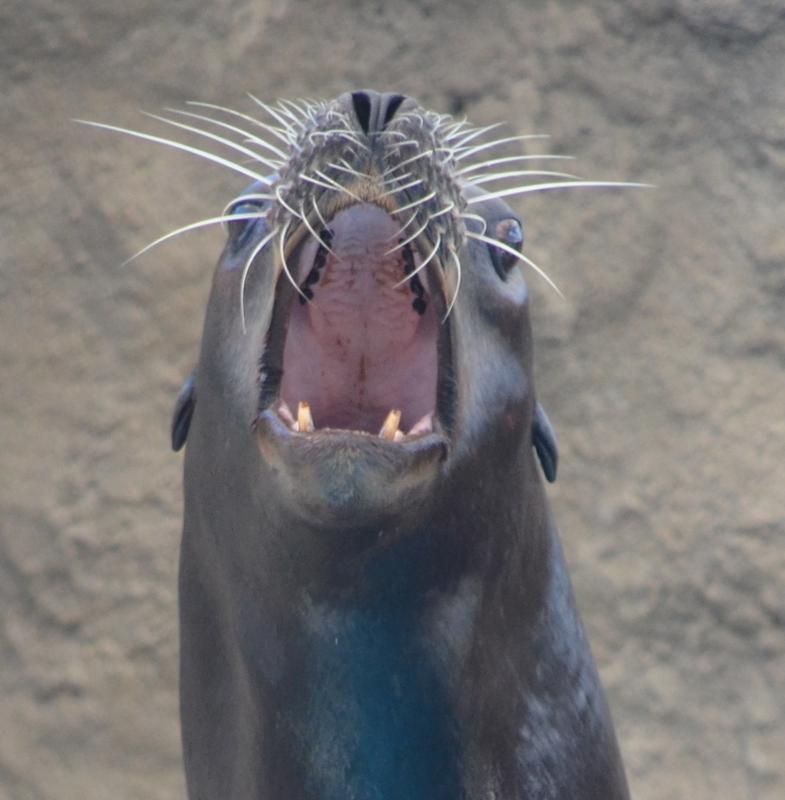 First to appear in front of us was Pepper, a Californian sea lion who was relocated from a zoo in Europe (Holand). Pepper is relatively young, full of energy and quick to learn. Above: Seal standing on its fin carrying entire body weight, and saying 'hi' with a fin! Below- A seal demonstrates getting entangled in an abandoned net- the show urges people not to throw waste stuff into ocean, as they can take life of marine animals. Seals swimming around, performing stunts, splashing water on audience on command. Seal with its mouth wide open. The main attraction of the show was seals jumping up in air and kissing the pots hung from ceiling. A volunteer was sought and this little girl stepped forward- she got an opportunity to pet the seal. Overall, it was an entertaining+educational show to watch at Taronga. I also made a short video, but I couldn't focus on both photos and videos simultaneously, standing among the crowd. Watch it below. More posts on Taronga coming soon. @Alok- Yes, I have read your post on Taronga.. I am trying to break into smaller topics and do more posts instead of trying to cover all in one. There is an endless array of attractions that the entire family can visit here in Sydney. It is all about fun and entertainment from morning until night and animal shows are just the tip of the iceberg. There are plenty more activities which are bound to fill up your itinerary for your entire trip.